Utilizing a closet is a great way to create space for a work at home office. You looked through every nook and cranny of your home, but you simply don’t have any available space to create a home office. Or do you? Many savvy space-seekers are turning overflowing closets into chic—and functional—office spaces. Here’s how to make your work at home dream a stylish reality. Pick your closet. Sure, all of your closets are packed to the brim, but you probably aren’t using half of the items (or more) in them. So go through your home and decide which closet could best serve as an office space. Calculate factors such as which closets are located in high traffic areas and what the lighting conditions are when making your decision. Clear it out. It’s time for some tough love purging. Go through the entire closet and take out every item. Don’t leave any household items in the space—such as comforters or your grandmother’s china platters—stuffed in the upper shelving of the closet. You’ll need every inch of room available in order to make your new office work for you. Figure out your needs. 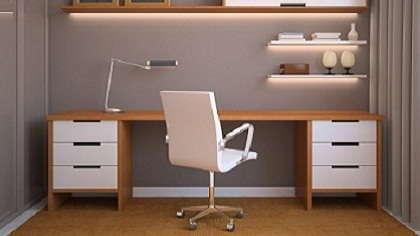 If you weren’t a minimalist before, you will be with your newfound office space. Determine what you truly need to make your office space functional. So while you might want to have a separate scanner, printer and fax, it might be best to purchase an all-in-one machine. If you know you’ll need a lot of storage, invest in some quality shelves, too. Make it pretty. Just because it was your former linen closet doesn’t mean your new digs should look like, well, a linen closet. Get a pint of paint from your local home improvement store and paint the back wall and sides of the closet for added oomph. Decorative boxes can hold ugly office supplies like staples and rubber bands, keeping them organized—and out of sight. You can even add photo boards and put up photos of your fam or inspirational photos to help personalize your space. Remove the doors (or not). You might ask yourself if you should remove the doors from your closet. It depends on where the closet is situated in the rest of your home. Leaving the doors gives you potentially much more space to hang office items such as a calendar or important notes. It also gives you the option to close the door—and close up shop—when you are done working for the day. If you’re looking for a more open space concept (and it aesthetically compliments the rest of your décor) you can remove the doors and add some pretty curtains. Just because you think you don’t have space for it doesn’t mean you can’t have an awesome home office. Simply put on your creativity cap, and a small, yet chic, home office could soon be yours.